Guide Your Career is a new and captivating book by Seamus Whitney that will help guide you through the process of making Career Choices. This book will benefit any person involved in making career decisions or if advising /helping others making career choices. Adults who feel stuck and are considering a career change in the near future. Parents guiding and supporting their children through the hugely important CAO application process. Students who feel overwhelmed by the prospect of making major course/college decisions. Seamus’ book is packed with inspiring case studies, designed to illustrate how many people have overcome their own personal challenges and obstacles, to find career success. Guide your Career will help you understand how the process of making career choices works. This book will help you get in touch with the real you, and give you the confidence to make the decisions which support the unique person that you are. 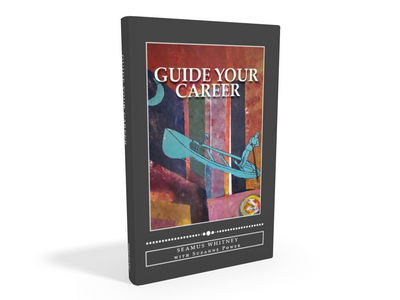 In Guide your Career Seamus shares all of his experiences with you, and lays out a pathway for you to follow which is guaranteed to propel you towards an inspiring future. Make work, work for you! Guide your Career will get you thinking, acting, responding and working differently. Seamus Whitney, one of Ireland’s top career guides, has observed human nature from a work perspective for over 40 years. His insights encourage, invest and invite workers to take action and make or find work that works for them. A former HR high-flier he found his niche, taking risks and action to establish a consultancy where clients listen not only to him, but to themselves. Today’s marketplace means the average worker will have three careers. So proactivity is a prerequisite. Ditch the business slogans, find your personal vision, and pave the way to the work objective that most suits. Today’s step will lead to tomorrow’s outcome. Written with author Suzanne Power, Seamus sketches the big picture making this book a must read not just for anyone working, but anyone focused on what it means to take an active part in society.